If you love slow cooker soup recipes, you will love this mini meatball soup recipe. It combines tasty pork and beef meatballs, flavored with Italian seasonings and Parmesan cheese and cooks them in chicken broth for a lighter soup. Add a little pasta and you have a light and delicious Italian soup recipe that is very easy to prepare. This easy soup recipe can be cooked in a slow cooker or an instant pot. You can also cook it stove top. Easy soup recipes like this take the rush out of weekday dinners. Just serve this wonderful soup with crusty rolls and a large salad. You will need a minimum 5-quart slow cooker or instant pot for this recipe, or, for a smaller crockpot, cut all the ingredients in half. Or look below for instructions for making this soup if you don’t have a slow cooker. In a large bowl, combine the beef, pork, Parmesan, bread crumbs, eggs, parsley, salt and pepper. Using your hands, roll the meat mixture into 3/4-inch meatballs. Place the meatballs in your slow cooker stoneware. Gently pour in the broth. Cover and cook on Low for 8 to 9 hours or on High for 4 1/2 to 5 hours, until the soup is bubbling and meatballs are cooked through. Stir in the spinach. Cover and cook on High for 10 to 15 minutes or until greens are wilted, bright green and tender. Stir in the cooked pasta. Ladle the hot soup into bowls and sprinkle with additional Parmesan, if desired. If you don’t have homemade chicken stock, use ready-to-use chicken broth. I like to keep 32 ounce (1 L) Tetra Paks of broth on hand, especially the sodium-reduced variety. They come in handy when you’re making soups and stews. Another option is to use three 10 ounce (284 mL) cans of broth and add enough water to make 6 cups (1.5 L). Avoid broth cubes and powders, which tend to be salty. You can make this recipe even healthier by using ground chicken or turkey for the meatballs. If you don’t have a slow cooker you can make this soup on the stove. Simply put the meatballs in a large soup pot, cover with the broth as the recipe states above and cover the pot. Bring it to a boil, then lower the heat to medium low and cook for about an hour. Add the cooked pasta and heat for about 5 minutes. The addition of the spinach and parsley make this a very healthy soup recipe and may even get your kids to eat their veggies. This soup recipe is a fairly good diabetic recipe, although some diabetics may be too sensitive to carbs to handle the pasta. If that is you, simply cut the amount of pasta you use, or omit it altogether and fill the soup with more vegetables. 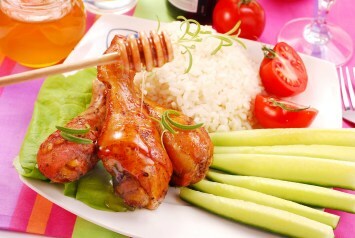 This recipe comes from a fantastic cookbook by Donna Marie Pye called Easy Everyday Slow Cooker Recipes: 200 Recipes . It is filled with great ideas for easy crockpot meals. I love doing the same thing – making tasty easy soup recipes with what’s on hand and needing to be used up. You can come up with some fantastic easy meal ideas that way, just like Donna-Marie has in her cookbook. 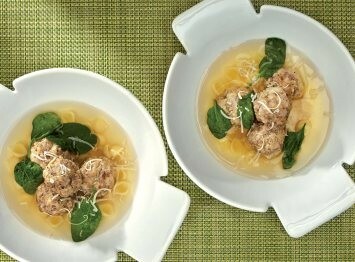 Look here for tasty soup recipes like this meatball soup. Courtesy of Easy Everyday Slow Cooker Recipes by Donna-Marie Pye, 2014 © www.robertrose.ca Reprinted with publisher permission.